PUTIEN~ They have outlets in Singapore, Malaysia, Indonesia, Hong Kong, Shanghai, Taiwan and Guangzhou. at ION orchard. The PUTIEN brand traces its roots to its the beautiful city of Putian in China. It has a rich cultural history. 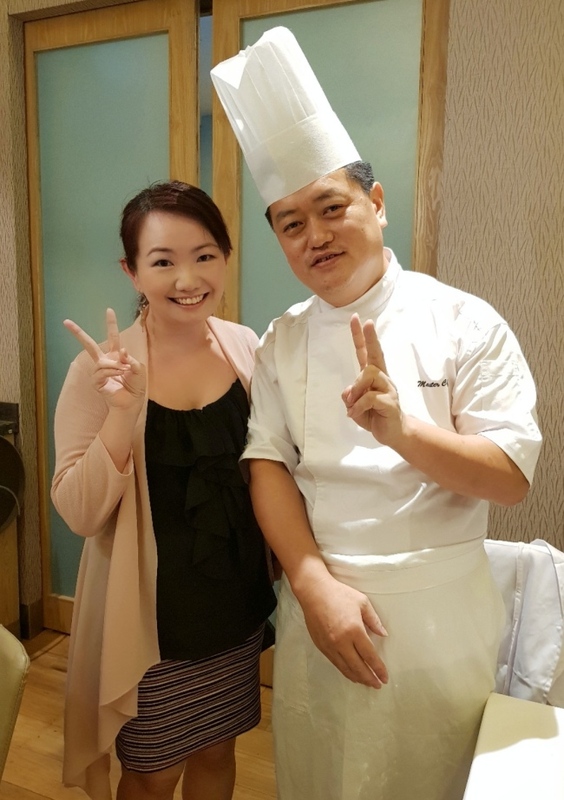 Putien (Kitchener Road) has earned its first Michelin Star in 2016! Thanks PUTIEN, Chloe and Rachel for hosting us. PUTIEN Bian Rou Soup (S$4.80++) A culinary heritage dish. I am impressed by the making of this dish. 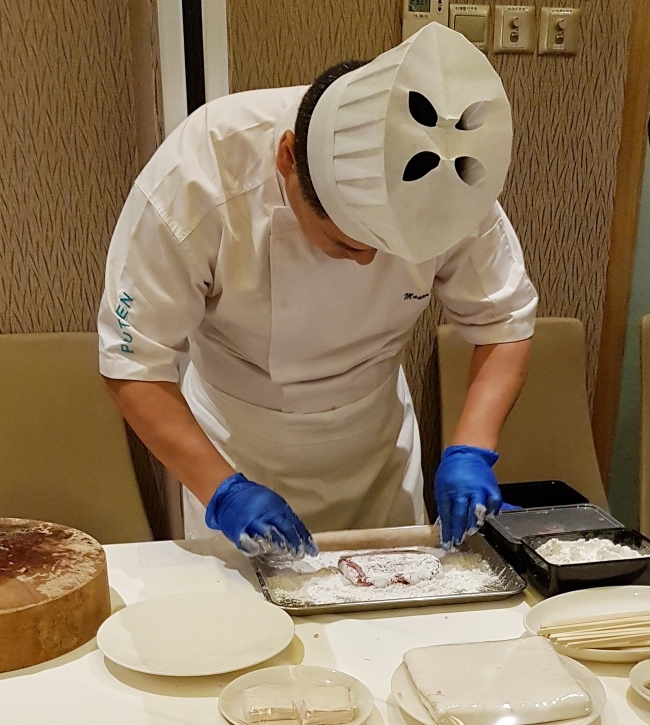 90% of the Bian Rou wrapper is made of fresh lean pork! The paper-thin meat wrapper was actually made by their amazing chef hand pounding 12,000 times on their fresh high quality hind lean meat. Thereafter the three pounds of meat is kneaded into a 3m Long and 7m Wide Wrapper. It looks like a white cloth. So impressive! The wrapper is then cut into 5cm by 5cm square pieces. Now then it is ready to wrap the savoury pork filling! They will then be served in a clear broth flavoured with vinegar, soy sauce and a sprinkle of fried scallions and spring onion. An enormous amount of effort behind this lovely bowl of soup. 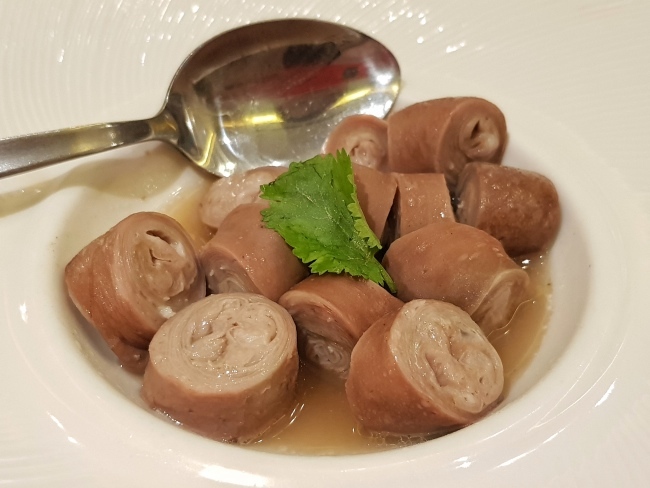 Braised Pig Intestine (S$14.90++) They hand folded portion between the large and small intestine loop after loop. There after, it was braised with therir 12 spices house sauce for at least 45 minutes. Both the intestines and sauce are prepared every 2-3 days and the whole process takes about 7-8 hours each time. It is flavourful with QQ springy springy texture. Bamboo Herbal Prawn (S$5.90++) This dish is perfect during a cold weather. 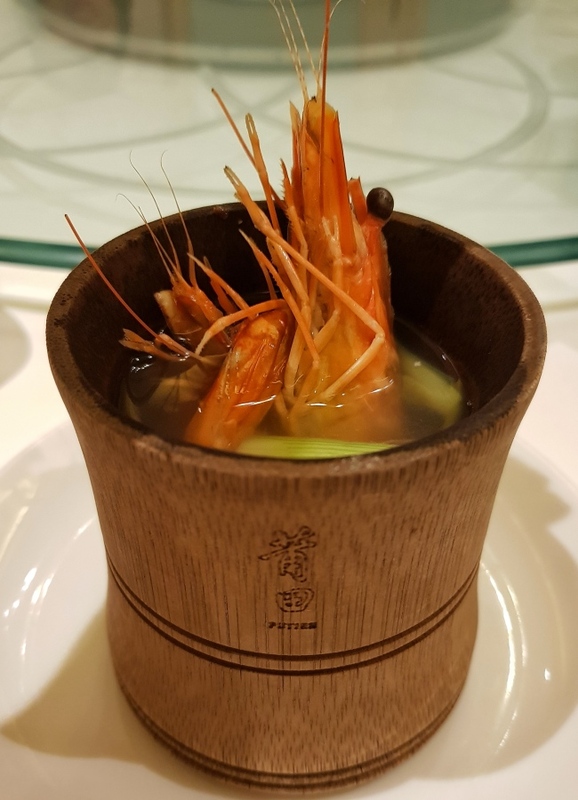 The prawn was having hot "herbal bath" in the bamboo container. I love the "herbal bath" - A light concoction of chinese herbs like angelica root and Chinese wolf berries infused in chinese wine. It is so delicious and comforting. I slurp all up. So delicious! 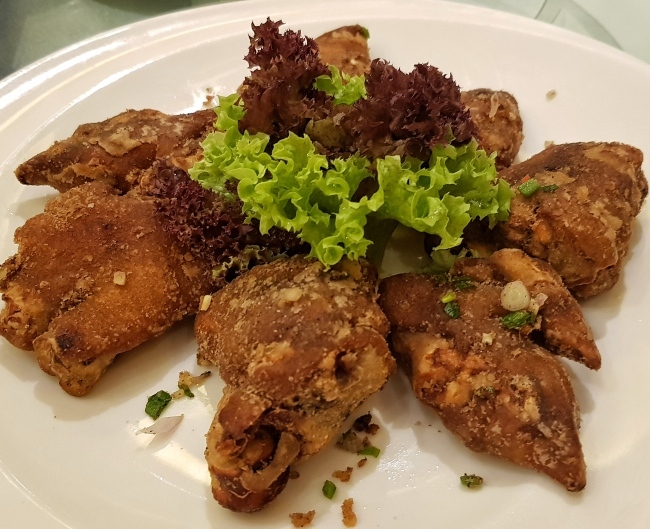 Deep-fried Pork Trotters with Salt & Pepper ($6.50++ per piece) They use only 7-inch pork trotters from Australia. Each trotter went through a 12-hour preparation before being served. The skin is crunchy but not oily. You are in for a collagen treat. Great for skin! Fried Heng Hwa Bee Hoon $9.50++(S) $19.00++(M) Another culture heritage dish. 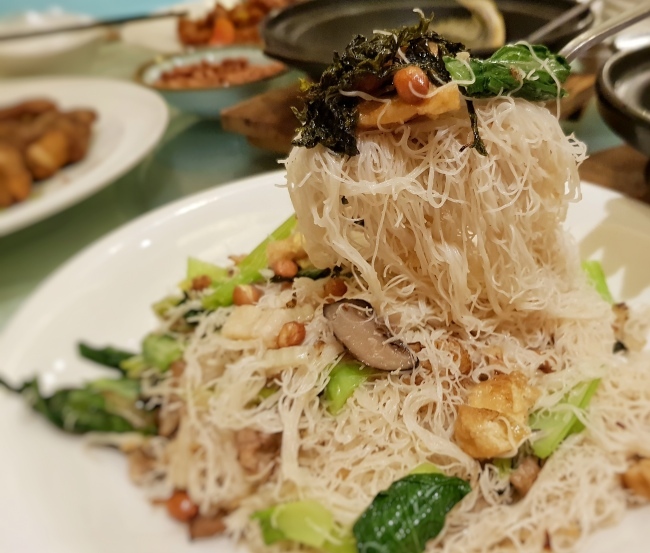 The rice vermicelli is dried naturally under the sun. This gives it a even more QQ texture. 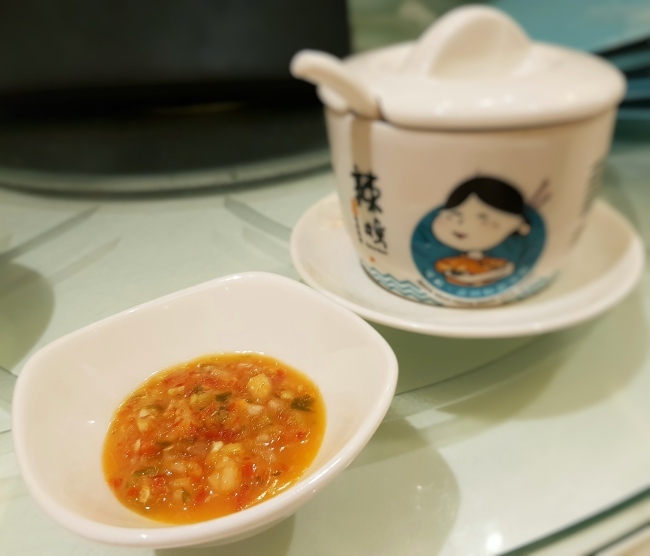 I enjoy it even more with PUTIEN’s handmade chilli sauce. They also use pork bones and old hens stock to flavor the bee hoon. 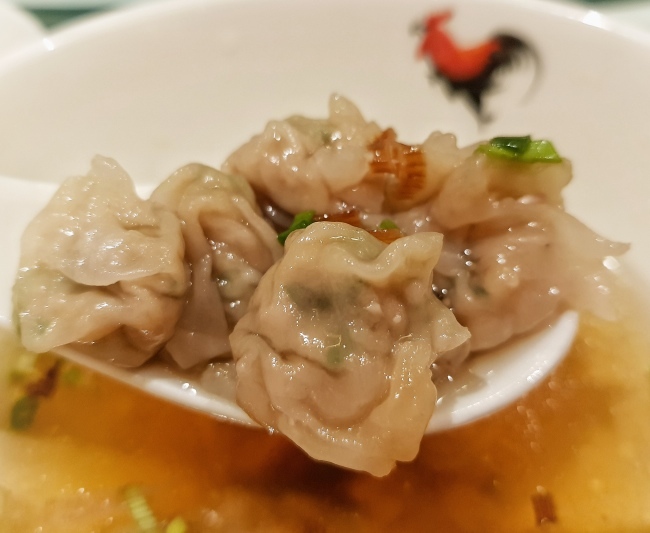 It is a MUST-HAVE every of my PUTIEN meal! Top Favourite! 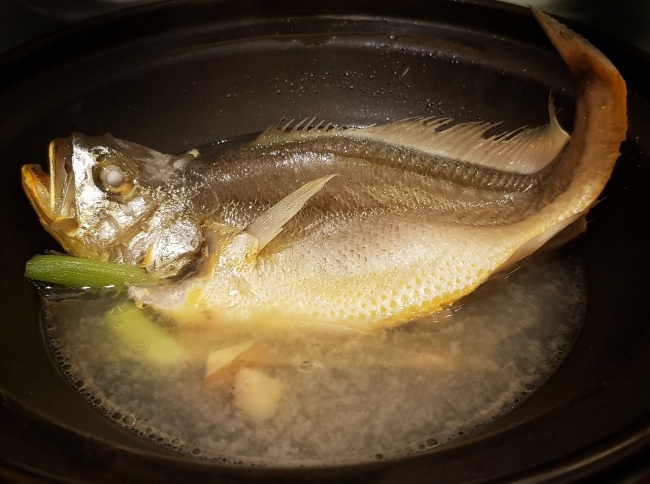 ‘100-Second’ Stewed Yellow Croaker ($13.80++) The yellow croaker from Xiapu in China (180g-200g) is stewed precisely for a hundred seconds! This will keep the meat tender and sweet. Amazing! Usually it will take a 8-10 minutes for me to cook a fish. Very tender meat! 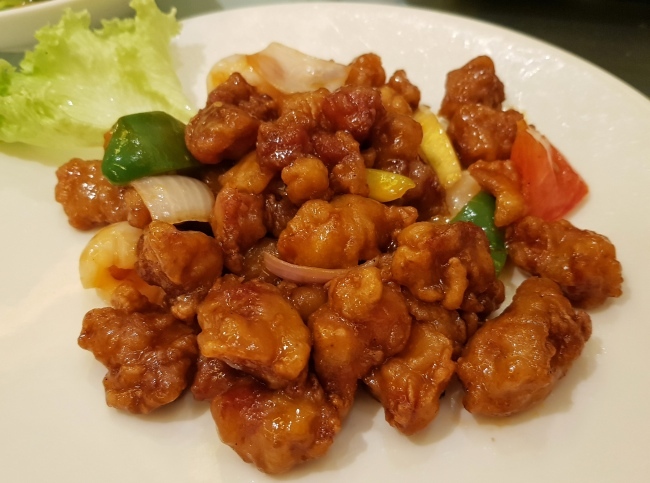 PUTIEN Sweet & Sour Pork with Lychees $13.90++(S) $20.80++(M) This deep fried lean meat of pork waist is also another one of our MUST-HAVE favourite! 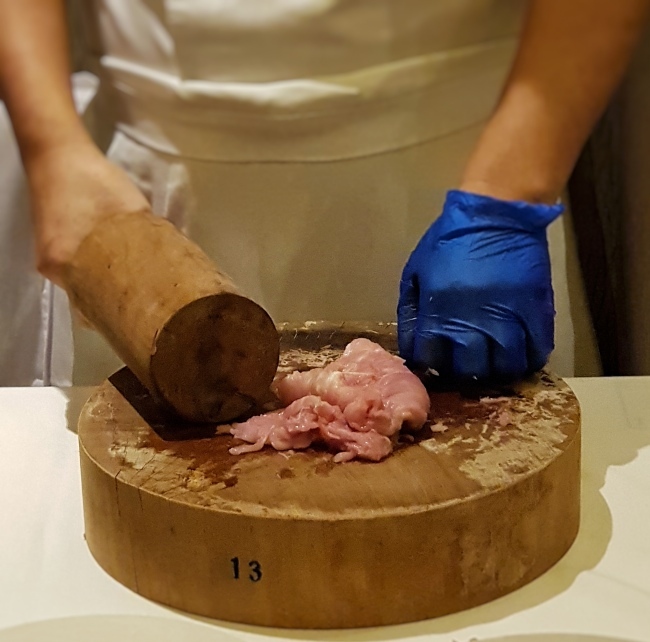 The sweetness and juiciness Lychee (one of my favourite fruit) complement the meat so well. Not too sweet. Just a gentle sweet lingering taste aftertaste. Interesting fact: Lychee is one of the Four Putian Fruits. The rest are Loquat, Pomelo and Longan. Stir-fried Yam $13.50(S) $20.20(M) The dish that tempts me for more helpings! They only use the middle and best portion of premium yams. 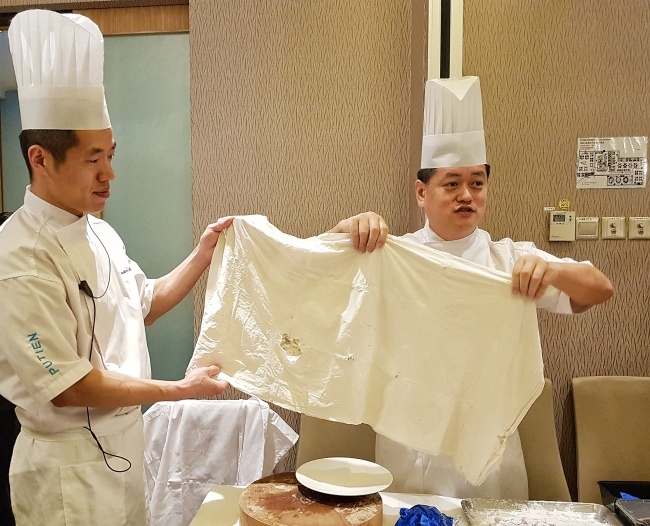 I understand from the chef that it have to be middle as the top will contain too much water and the bottom will have too much fibre. 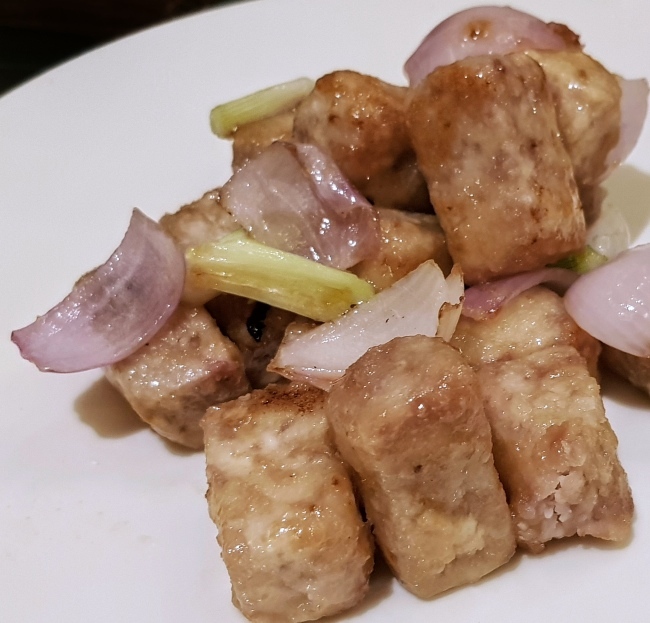 The yam cubes is there fried to crispy brown. The savoury-sweet sauce is perfect to go with them. Crispy Outside with a Light fluffiness Inside. 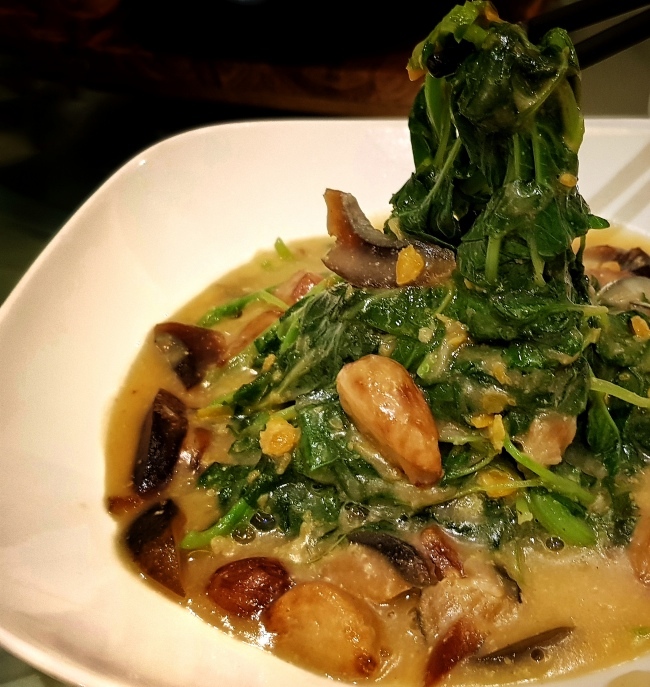 Spinach in Supreme Stock $13.50(S) $20.20(M) Soft tender Baby round leaves Chinese spinach are stir-fried on high heat and then stewed in a rich flavourful supreme stock mix of century egg and salted egg. I always like soft tender chinese spinach. Pumpkin Cream with Ice-cream $5.90++ I am a pumpkin lover. I understand it is good for the heart. It is rich in fiber, potassium, and vitamin C content. Glad that they actually use it to make dessert too. 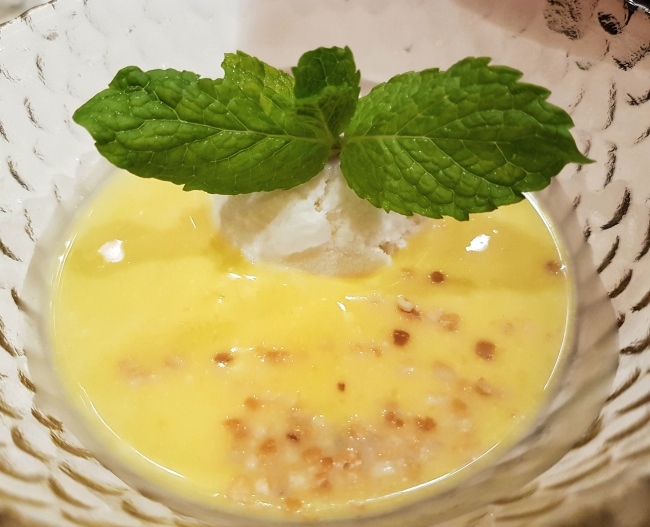 The coconut ice cream complement well it too. Chilled Lemongrass Jelly with Fruits $4.90++ I understand that Lemongrass has a lot of great benenfits. It is great for lowering cholesterol and detoxifying the Body. 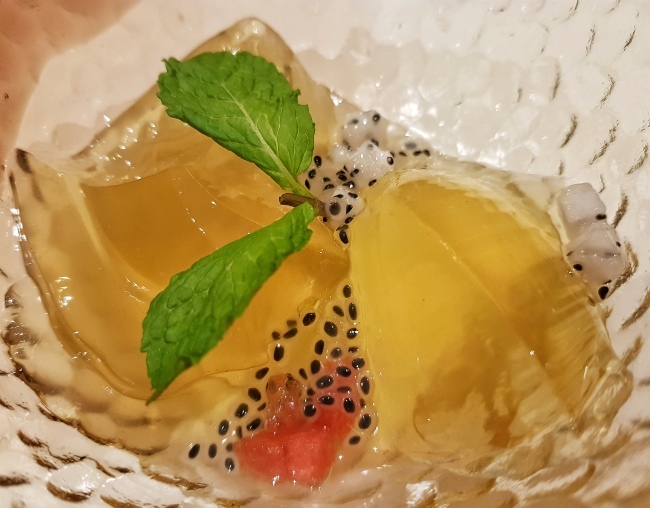 A refreshing Dessert with dragonfruit and water melon little cubes.